Iwate Army Airfield is the northernmost site in Japan from where a tokko (special attack) squadron sortied in WWII to carry out a suicide attack against enemy ships. On August 9, 1945, the 255th Kamiwashi (Divine Eagle) Squadron took off from this airfield to seek enemy ships off the coast of Kamaishi in southeast Iwate Prefecture. Three squadron airmen in Type 99 Light Bombers (Lilys) carrying 500-kg bombs never returned. In July 1937, when the Sino-Japanese War began, the Iwate Prefecture Conference of Mayors passed a resolution for donation of an Aikokuki  plane to the Army and construction of an airfield. 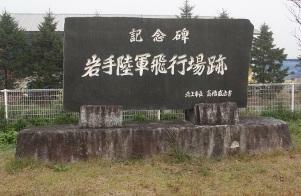 The two towns of Kurosawajiri and Hanamaki and the 11 villages of Fujine, Ezuriko, Iwasaki, Yokokawame, Iitoyo, Futago, Yuda, Sasama, Ota, Yuguchi, and Yumoto formed the Gotono Airfield Construction Association. The group purchased a site from the land owners at a low price and planned its conversion to an airfield. Its area of 1.2 million tsubo (396 hectares) surpassed that of Kumagaya Airfield (314 hectares) in the Kanto Area. In those days when there was no construction machinery, the uprooting and leveling work was carried out entirely by human effort. This included labor from Patriotic Youth Brigades that were formed based on prefectural chuto gakko (equivalent to current high school) youth associations and workplaces in the local area. On September 25 of the following year, they welcomed Prince Chichibunomiya and held a dedication ceremony. It was named "Iwate Army Airfield." From the groundbreaking ceremony until completion was 148 days. The total construction cost was only 87 thousand yen with all of the volunteer labor that was used. Originally it was used as an Army training airfield, and biplane trainers called Akatonbo (Red Dragonfly) flew in the sky. However, in 1944 it suddenly was converted into an operational base as the mainland was subjected to air raids. Tokko (special attack) squadrons called Kamiwashi (Divine Eagle) Squadrons transferred here. After training for a short period, they were deployed to various other airfields. On August 9 of the following year, there was an air attack by American carrier-based aircraft, and the airfield's facilities were damaged. Mitsuru Satoh (10 years old at the time), a 4th grader at Yokokawame National Elementary School, lost his life when a bomb was dropped on a neighboring house. On the same day, a special attack squadron of three planes took off, but First Lieutenant Kimio Yoshimura (22 years old), Second Lieutenant Hideo Watanabe (22), and Corporal Hiroshi Ishii (19) never returned. On August 15, 1945, the war came to an end, and Gotono's role as an airfield ended. The country sold the land, and a group of settlers moved in and turned the area again into farmland. In addition, in one corner manufacturing companies were invited to set up plants, and it developed into an industrial park. Without any trace remaining of the airfield from those days, it was forgotten. Now 50 years after the war's end, through donations from local residents and other supporters and with kind support from Kitakami City and Hanamaki City, with the hope for future peace we erect this monument to convey to future generations that this place was the airfield site. 1. Aikokuki literally means "patriotic plane." Aikokuki refers to planes contributed by civilians to the Japanese Army under a program in the 1930s.